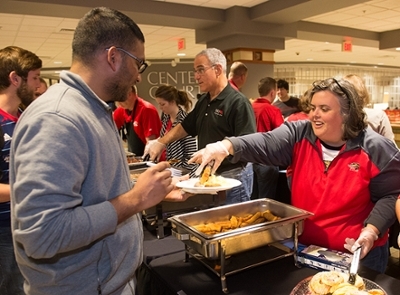 Approximately 660 Southern Illinois University Edwardsville students were treated to a hearty breakfast Sunday night, served by SIUE administrators, faculty and staff. The Morris University Center, Kimmel Student Involvement Center and University Housing have sponsored the late night breakfast event since fall 2013. 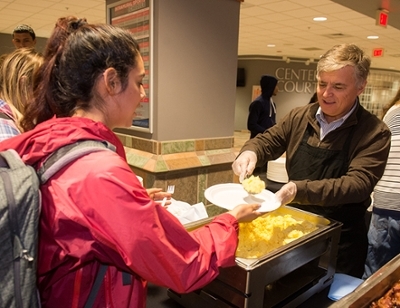 Photos: SIUE Chancellor Randy Pembrook serves scrambled eggs to junior nursing student Jasmine Gaona. Provost and Vice Chancellor for Academic Affairs Denise Cobb smiles as she serves breakfast to graduate student Uday Vettigunta.